The Colony is an exclusive new neighborhood providing premier access to Sunday River, resort privileges that are unmatched, and a convenient, private location just a short drive from the slopes. 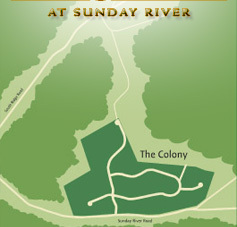 Building sites at The Colony are set within an historic pine plantation. The flat valley floor that hosts these lots is ideal for building. Unique views of Sunday River’s eastern peaks include the famed White Heat trail, while some lots also capture Sunday River’s North Peak and views down the valley. While owners and their guests might arrive at The Colony by turning off the mountain access, the trip to the resort base area is an entirely different experience. A private road winds through the site, providing a back door entrance to the main South Ridge base area. Contact Susan DuPlessis at Mountain Real Estate Company - 207.824.3100 - to learn more. Pricing and availabilty subject to change.